After your arrival at Kansai International Airport, check in to your preferred hotel/guest house. Book a place near the city center particularly near a train station such as Umeda and Namba districts. This will give you better access to dining options and tourist attractions. Also, flying with Jetstar gives you half a day to explore Osaka. Cebu Pacific and Philippine Airlines fly in the afternoon from Manila and arrive in Osaka between 7-8 in the evening. If you snagged that super cheap airfare from Cebu Pacific, you already have a day wasted. But that’s okay, you can explore Osaka on day 2. Start your Osaka adventure in the afternoon by visiting Osaka Castle, the castle that was built to be the center of the new and unified Japan. The castle can be accessed on a number of lines; the closest JR station is Osakajokoen Station on the JR Loop Line. 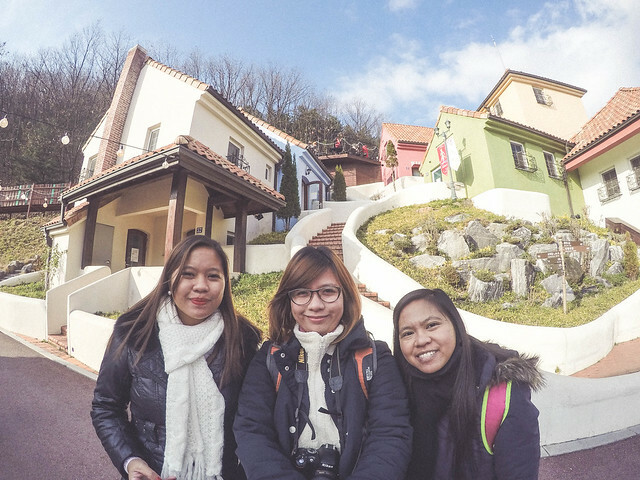 Then, visit another attraction before you make your way to Namba Station. Osaka Aquarium, the Tenmangu Shrine and Umeda Sky Building are some of the places you can visit. Spend the rest of the afternoon/evening in Dotonbori-Shinsaibashi area, the best place to experience Osaka’s food culture. The best way to get here is to take the Midosuji Subway line and get off at either Namba station (subway) or Shinsaibashi station. If you are planning to spend the entire day in Universal Studios Japan for The Wizarding World of Harry Potter (WWOHP), then that’s perfectly fine. Even if you are not an amusement park fan, like me, a trip to The Wizarding World of Harry Potter will surely bring out your inner wizard. SRSLY! Check out my blog post about TWWOHP right here. To get to USJ, take the JR Yumaseki line from Nishikujo station to Universal City station. Please use Hyperdia.com to check specific train times and routes. Coming from Osaka, you can take JR, Hankyu Rail or Keihan Rail to get to Kyoto Station. Getting around the city is very easy because of its extensive bus network. Though Kyoto also has trains and subway network, I find navigating the city easier when I take a bus. Raku Bus, the city-run public bus in Kyoto, will cover most of your travel needs. Raku Bus No. 100 goes to eastern Kyoto particularly the Higashiyama and Okazaki areas. Raku Bus No. 101 goes its way up the middle of Kyoto to the northern parts of the city. Raku Bus No. 102 goes to the northern part of Kyoto. Project Gora tip: Purchase a Kyoto All-day bus pass (JPY 500) for unlimited bus ride on Raku and Non-Raku buses. It is more economical than paying for individual tickets because each time you ride a bus, it will cost you a minimum of JPY 230. On day 4, consider Fushimi Inari as your first destination. Fushimi Inari Shrine is dedicated to Inari, the Shinto God of Rice. The place is famous for its thousand vermilion torii gates along the trail that leads to the forest of the sacred Mount Inari. The best way to access Fushimi inari is by taking JR Nara Line from Kyoto Station to JR Inari station (JPY 140). Travel approximately takes 5 minutes. Then, make your way to your second destination, Kinkakuji (Golden Pavilion), which is among the many UNESCO World Heritage Sites in Kyoto. It is a Zen temple with two floors completely covered in gold leaf. It was formerly a retirement villa for the family of Ashikaga Shogunate until 1408. Yes, this has been around for more than 600 years. The best way to access Kinkakuji is by going back to Kyoto Station following the same route then take Kyoto City Bus number 101 or 205. Travel approximately takes 40 minutes and admission is JPY 400. Spend the rest of the afternoon in Arashiyama District. From Kinkakuji, hop on Bus no. 101 and get off at Kitano Hakubaicho Station. Take the Keifuku Electric Railway aka Randen and get off at Arashiyama Station (requires a transfer at Kitabiranotsuji station). You can also try this only-in-Kyoto experience, Maiko Transformation for women or Samurai Transformation for men. Check out my Maiko Transformation experience right here. 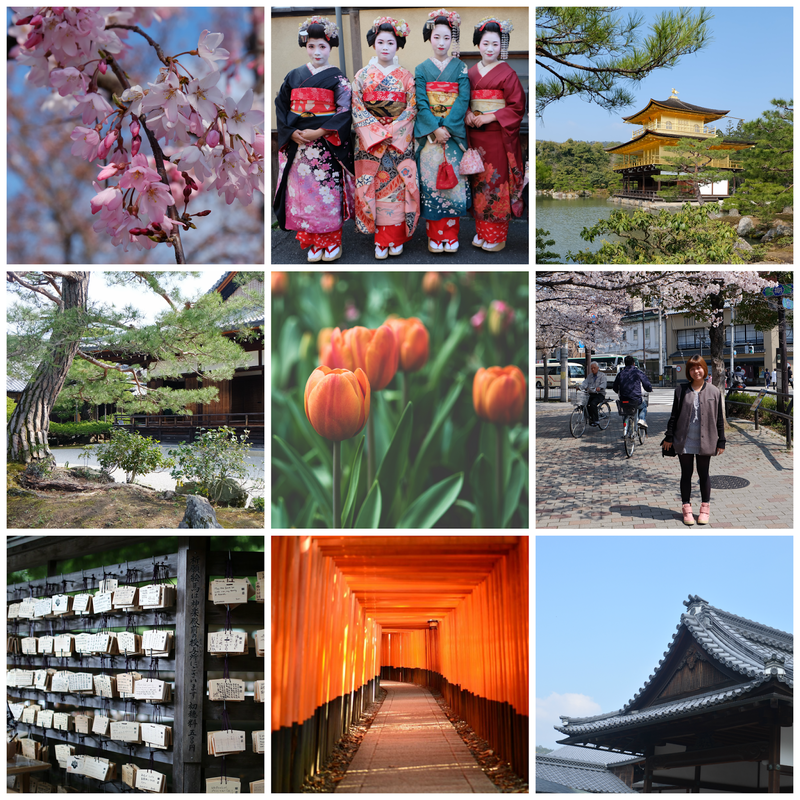 Travel from Kyoto to Tokyo via Shinkansen (Bullet Train). Nozomi, the fastest Shinkansen costs JPY 14,110 one way from Kyoto Station to Tokyo Station and travel approximately takes 2 hours and 20 minutes. Hikari, which is slightly cheaper at JPY 13,800 one way, takes a little longer at 2 hours and 40 minutes. The slowest Shinkansen, Kodama costs JPY 13,500, reaches Tokyo in about 3 hours and 50 minutes. Start your Tokyo adventure by having a Ramen lunch at Afuri Ramen in Harajuku. 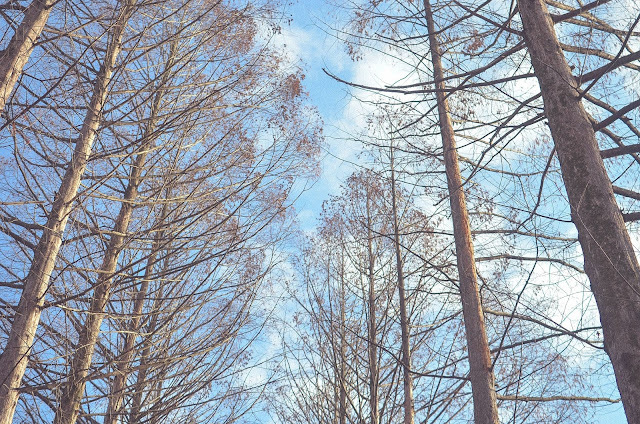 From Afuri Ramen, head to Meiji Jingu, a shrine dedicated to the Meiji Emperor and his Empress. Despite being situated in the busy area of Harajuku, all the hustle and bustle were cut off the moment you turn right and cross over the 40-foot giant torii gate. The walk through the forest to get to the shrine is very relaxing. Travel from Shinjuku Station of JR Yamanote Line to Harajuku Station approximately takes 5 minutes (JPY 140). End your day at Tokyo Metropolitan Government Building back in Shinjuku where you can get a glimpse of Mount Fuji under favorable weather conditions. This is also a perfect place for sunset viewing where you can get a panoramic view of Tokyo and beyond. If your travel dates happen to be in Spring, specifically Cherry Blossom season, do not miss Hanami viewing in Ueno Park, Shinjuku Gyoen, Chidorigafuchi or Sumida Park. 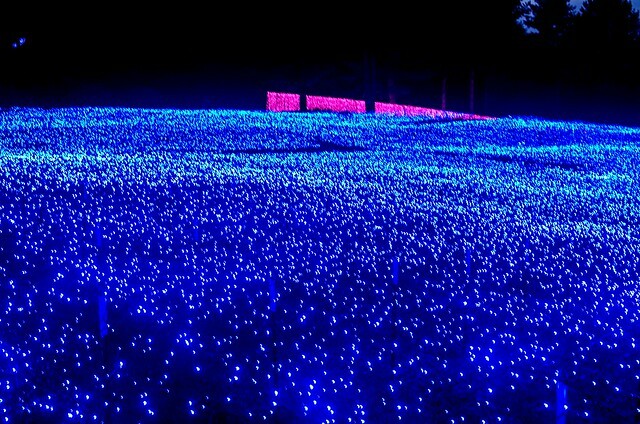 I also recommend going on a half day trip to Hitachi Seaside Park in Ibaraki. 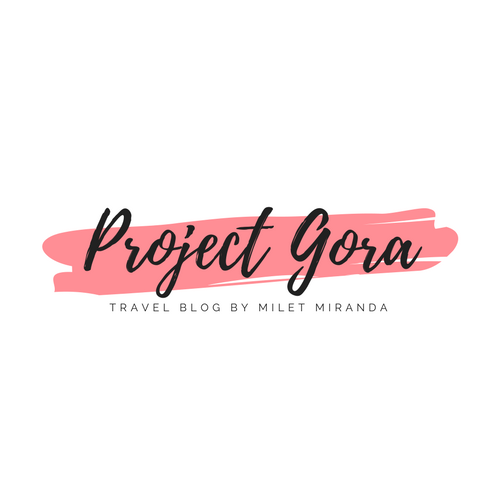 Check out my blog post right here. I'll let the pictures speak for themselves. To get to Hitachi Seaside Park, I’d highly recommend taking a train from Tokyo/Ueno. The journey takes about two hours and a single journey ticket costs JPY 4,000. 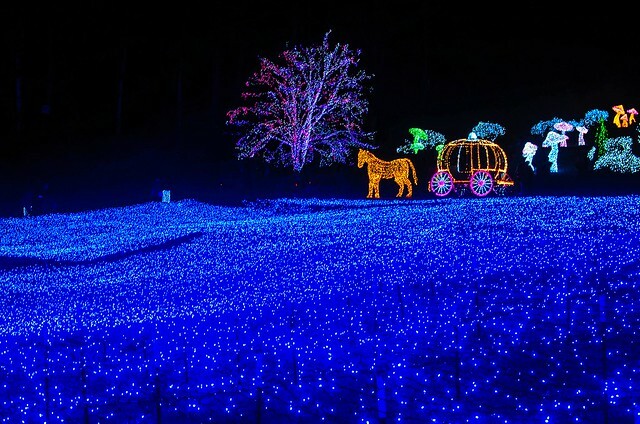 Get off at Katsuta Station and catch the Ibaraki Kotsu Bus going to Hitachi Seaside Park (15 minutes). Admission fee is JPY 410 for adults, JPY 80 for children aged 7 - 14 years and free for children under 6 years. Check out their website for more information. In the afternoon, check out some of Tokyo’s famous destinations like Akihabara, the center of Japan's otaku (diehard fan) culture. Don’t miss Harajuku, Shibuya and Omotesando. For dog lovers like me, pay a visit to Hachiko’s statue located in Shibuya Station’s Hachiko Exit. Another prominent landmark in Shibuya is the large intersection known as “The Scramble”. On your last day, you can spend a few hours shopping before your scheduled time of departure. Find the nearest Donki (short for Don Quijote), which is one of Tokyo's cheapest supermarkets selling a huge variety of goods. Buy some Japanese snacks like Tokyo Banana, Japanese Rice Cake Mochi Daifuku and Kitkat Matcha (Gren Tea) flavor to take home for your friends and family. 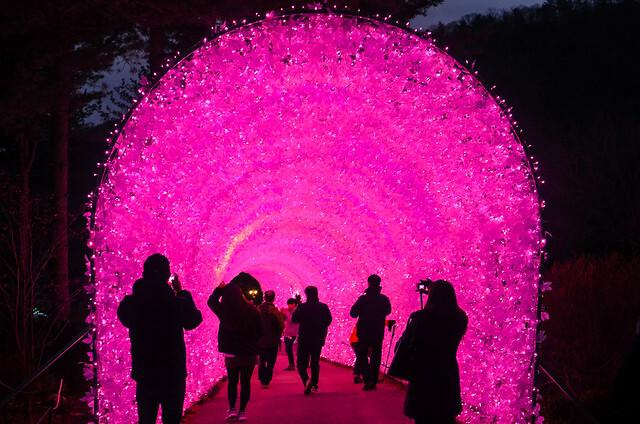 After shopping, head to Narita International Airport and take Narita Express. 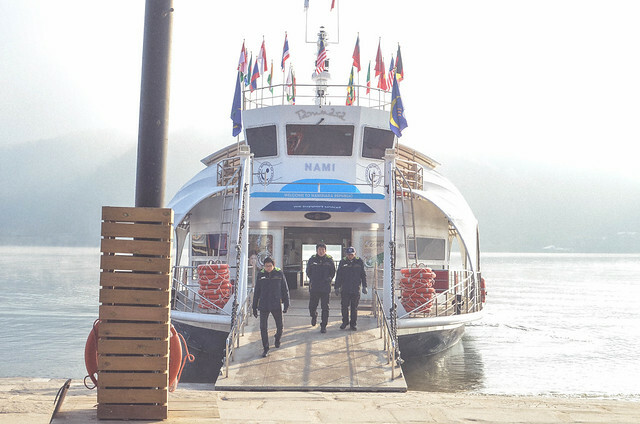 The regular price costs JPY 3,190 and travel is approximately 90 minutes. A cheaper alternative is Keisei Limited Express which requires one train transfer. From Shinjuku, take JR Yamanote line to Nippori Station (20 minutes, 230 JPY) then transfer to Keisei Limited Express to Narita Airport (about 75 minutes, JPY 1030). If you have a heavy luggage, you may consider taking the airport limousine instead. Get your Tokyo Narita International Airport Limousine Bus Round Trip Ticket here. 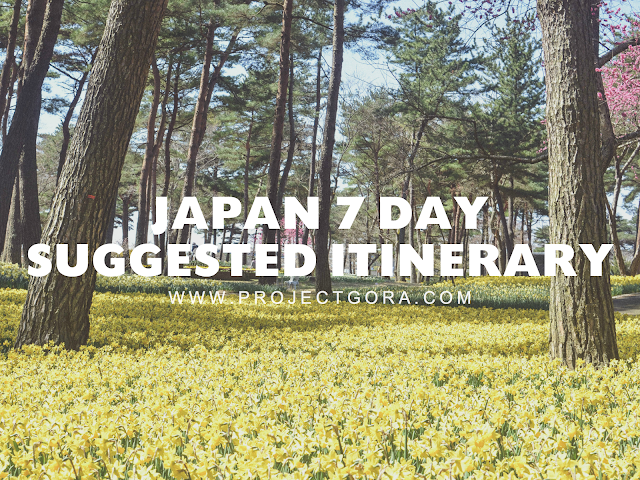 With this suggested itinerary, is a Japan Rail Pass worth it? The Japan Rail Pass costs JPY 29,110 (roughly USD 281) for 7 days. If you are going round trip to Osaka/Kyoto-Tokyo OR Tokyo-Osaka/Kyoto within a week, then it is more than worth it. If you are going one way (arriving in Kansai and departing in Narita or vice versa), then the pass will not pay off. 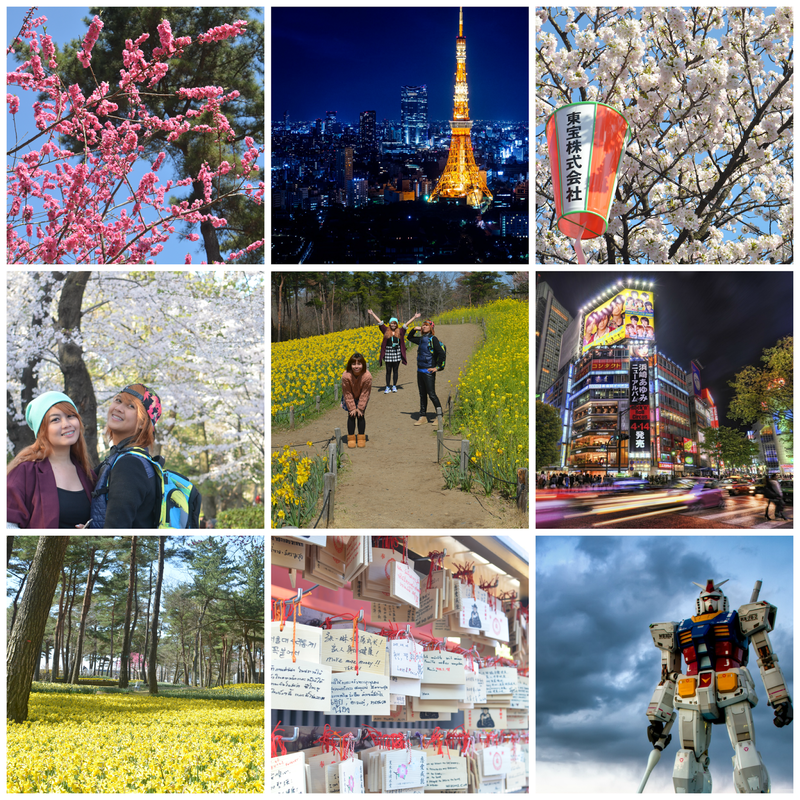 So, this is the end of my 7-day suggested itinerary in Japan. Got any questions? Comments? Insights? I’m all ears! Let’s chat down below. Arigatou! 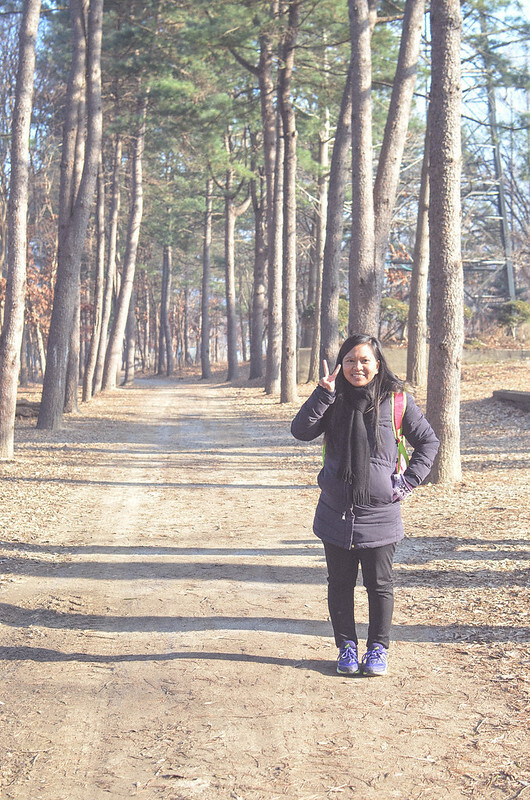 I’ve made it no secret, South Korea is one of my favorite countries in the world, perhaps maybe because of my fascination with Korean Dramas. I can’t believe it’s been over a year since I first stepped foot in this country. 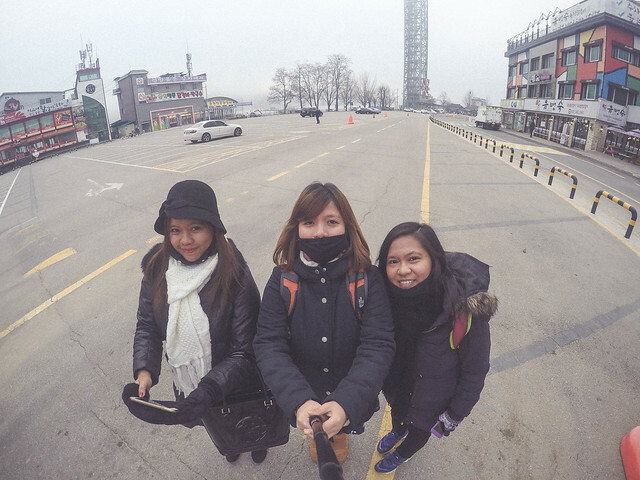 I visited in the winter of 2014 with my friends Jett and Maki for a week-long trip around Seoul and nearby provinces such as Jeju Island. 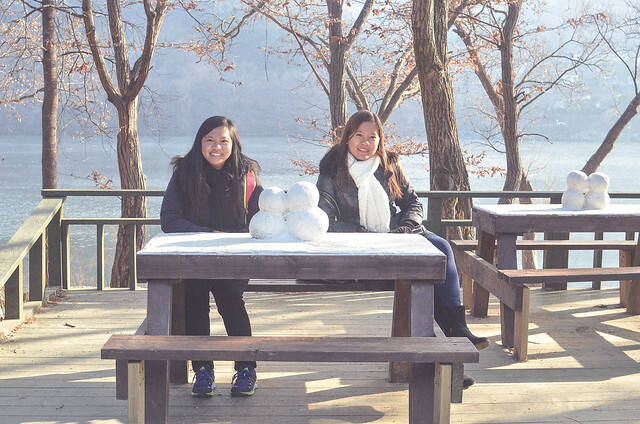 DJ, me and Sheila - it was 8:00 am when we arrived in Gapyeong Wharf yet the sun is still not up! 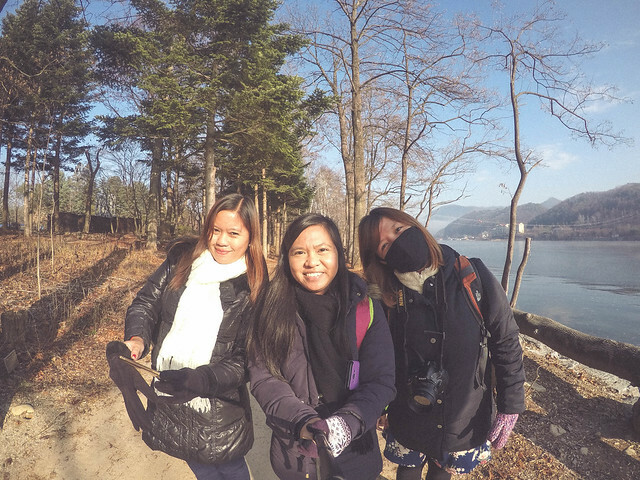 Our day in Gapyeong County in the Province of Gyeonggi started like this: on the parking lot of Gapyeong Wharf looking for a coffee shop. We got out of Hongdae Housetay Guesthouse at 6:00 am when it was still completely dark outside. 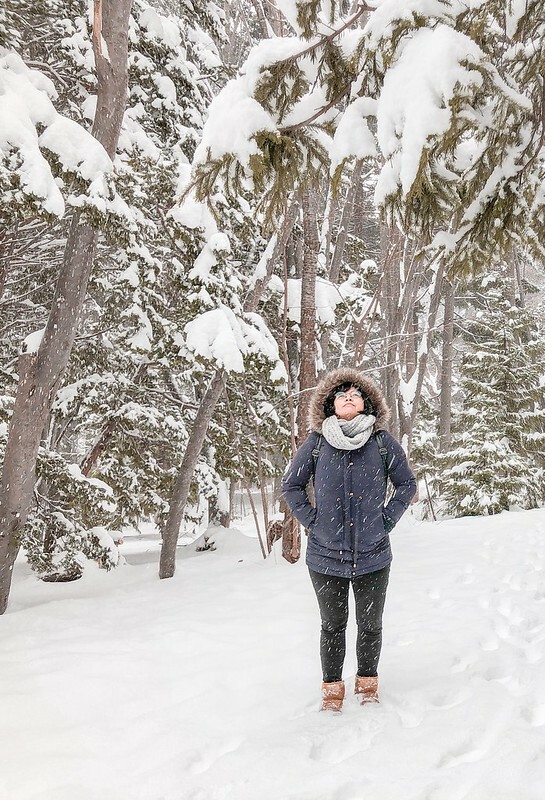 In winter, the days are shorter with the sunrise occurring later (around 7:30 am) and the sunset occurring earlier (around 5:30 pm). 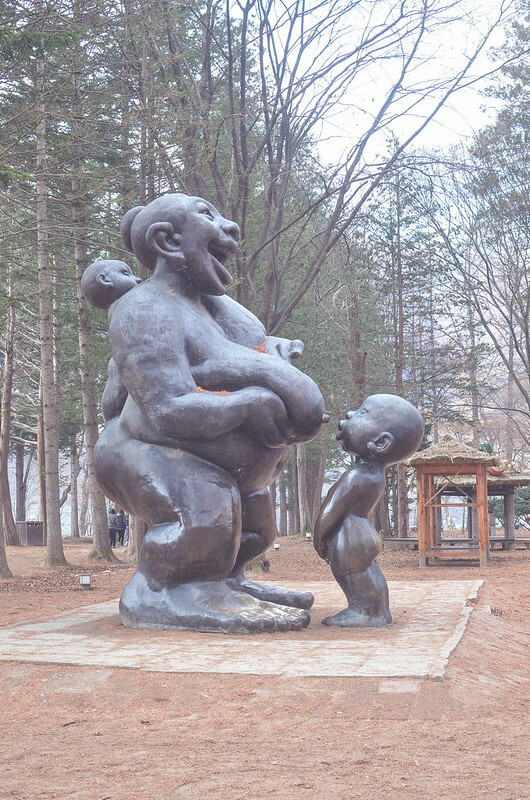 Planning a trip to South Korea? 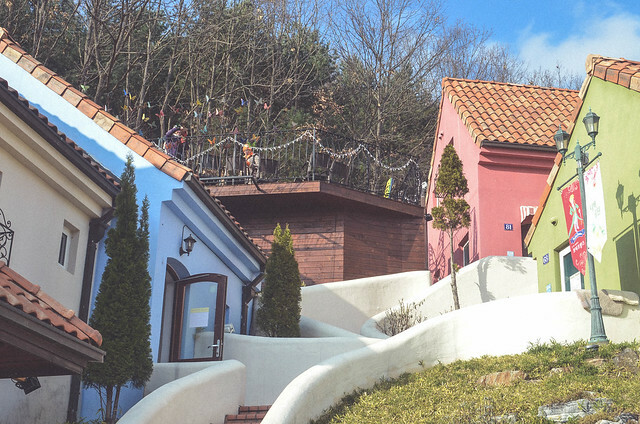 Check out Seoul’s best hotels below! 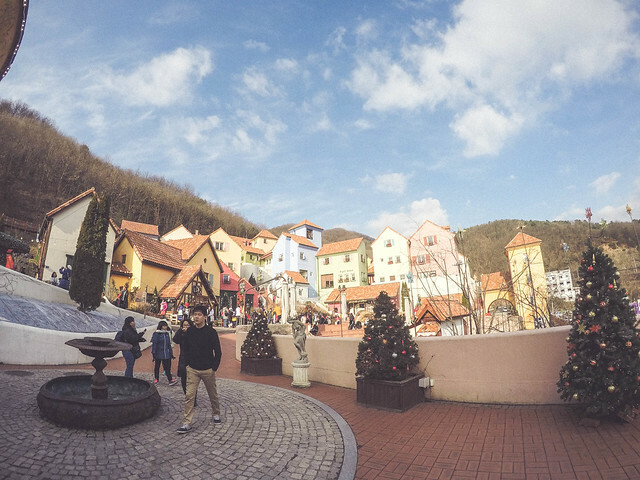 Also, if you want to spend a day getting the most out of your trip, be sure to avail the service of Gapyeong City Tour bus. 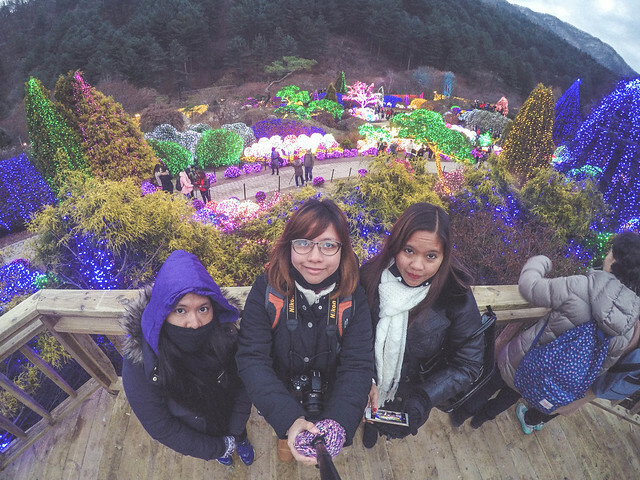 With just one ticket (KRW 6,000 as of December 2015), you can freely discover and enjoy your desired attractions in Gapyeong! 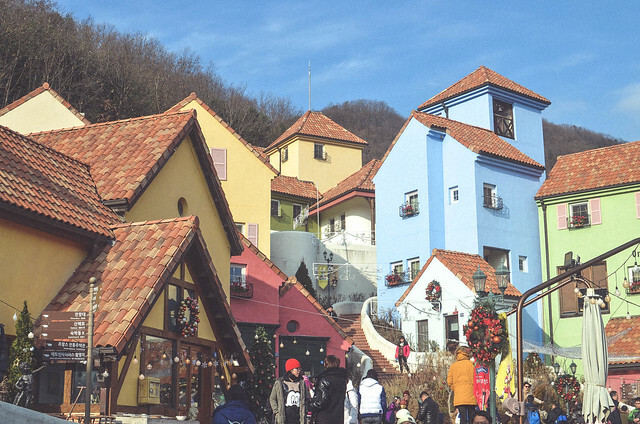 If you arrived early in Gapyeong Station, you may choose to take a cab to Gapyeong Wharf. This is cheap, especially if you are travelling as a group. 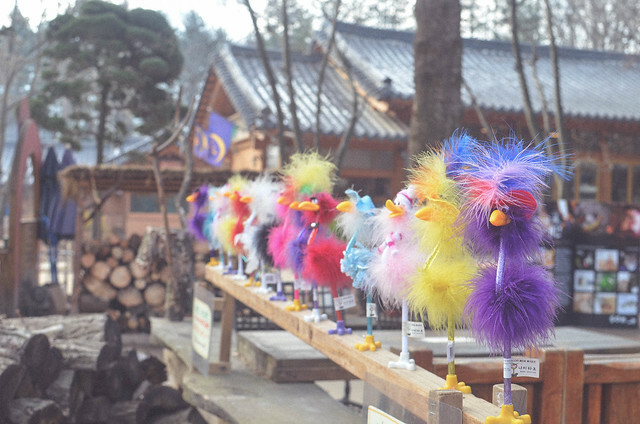 It should cost less than KRW 4,000. 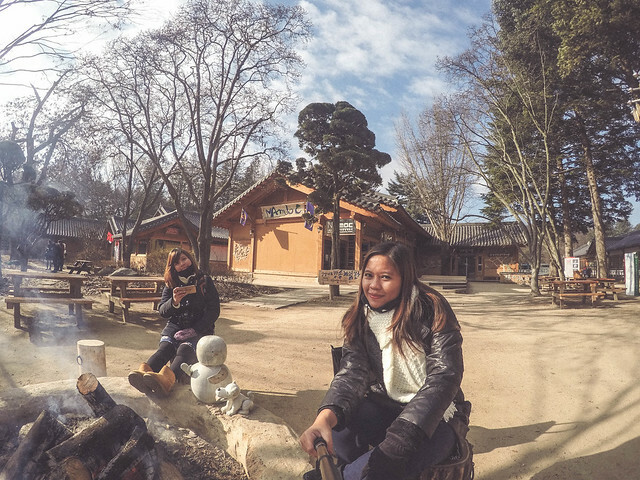 After breakfast at this random coffee shop, my friends and I bought our tickets to Nami Island which include admission and round trip ferry ride (KRW 8,000). It was around 9:00 am when we arrived in the island. 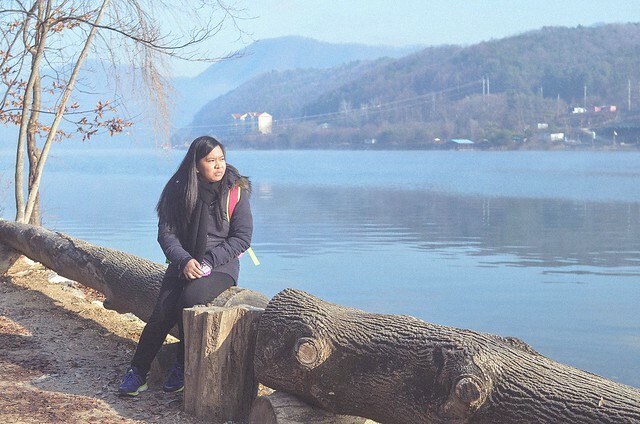 We arrived so early that the parking lot in Gapyeong Wharf was practically empty, which is very unusual because it is almost always pack with tour buses. I guess going on a Monday was really a great decision :) Anyhow, we decided to explore the back side of the island first to avoid other tourists and so we could get as many pictures as we want without any photo bombers. Lol. 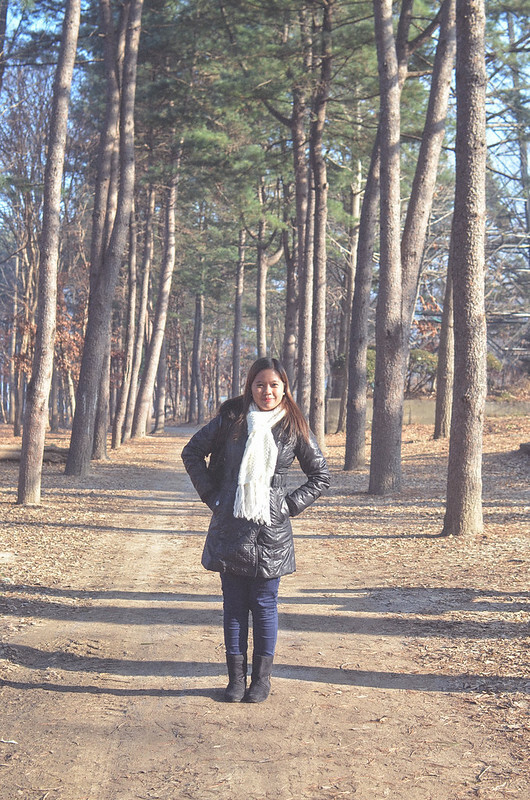 We walked along the almost frozen lake which was very picturesque and serene. We saw many playful chipmunks and squirrels. It was truly a lovely sight! 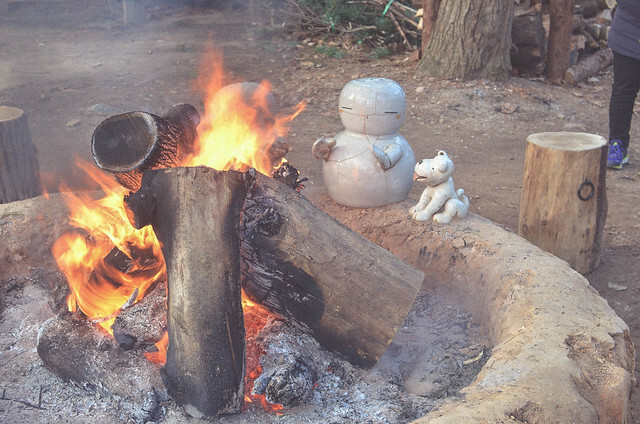 There are plenty of firewood stations in the island so you can gather some warmth! There are also plenty of restaurants and shops where you can buy coffee and some snacks. 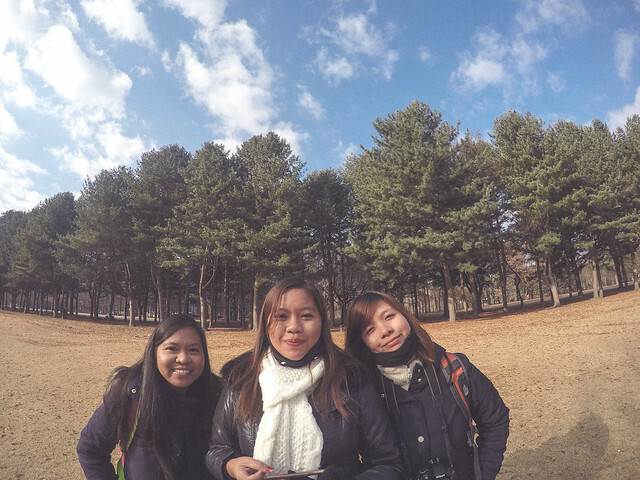 We spent two hours in Nami Island and that was enough time to see all attractions. 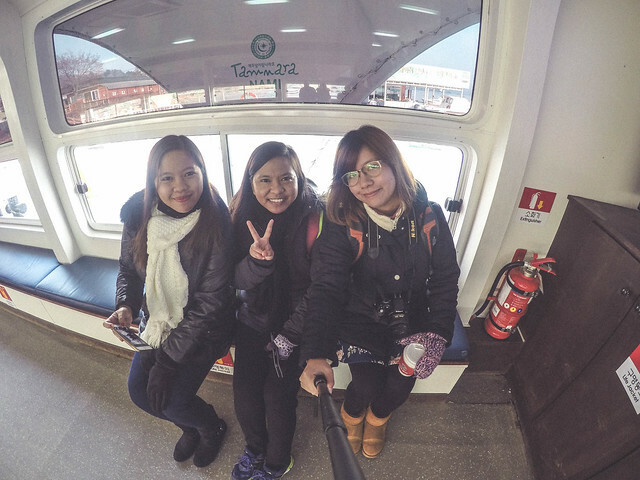 My friends and I went back to Gapyeong Wharf before noon and had lunch at one of the restaurants in the area. We went to this Dakgalbi restaurant, the same one I went to last year, and ordered their local specialty Dakgalbi. It is a spicy stir-fried chicken dish made with boneless chicken pieces, rice cakes, green cabbage, sweet potato, and other vegetables. Super delicious! 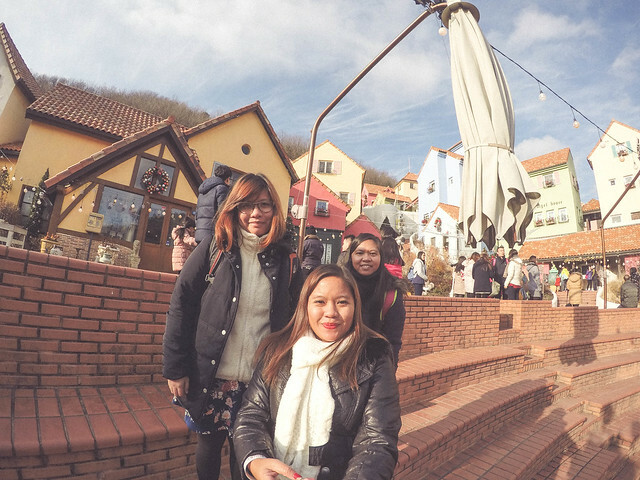 After lunch, we immediately went to 7 eleven and waited for the Gapyeong City Tour Bus that will take us to Petite France. 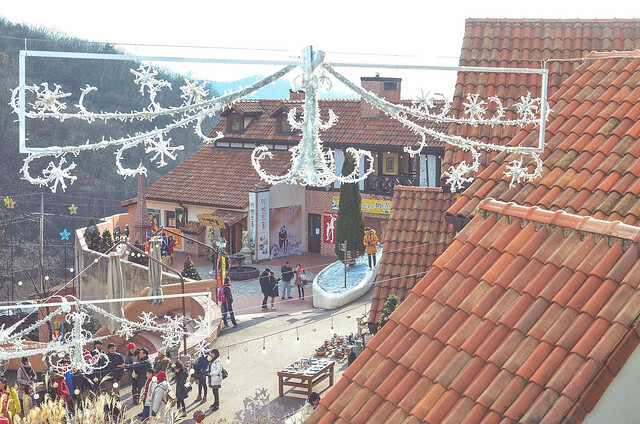 It only took around 30 minutes until we reached this French themed village. And, it was packed like sardines! 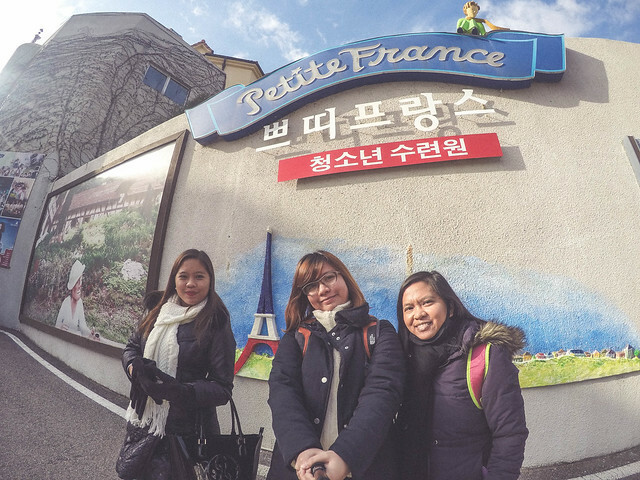 Petite France is pretty popular among Korean Drama fans because it where the popular TV series "My Love from Another Star" starring Kim Soo-hyun and Jun Ji-hyun was filmed. 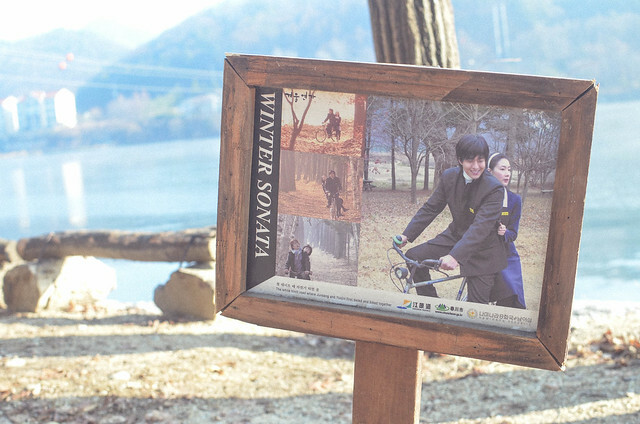 It was also the filming location of one of my all time favourite dramas Secret Garden starring Hyun Bin and Ha Ji Won. After an hour, we decided to wait outside the village for the bus going to the Garden of Morning Calm. We were not able to go inside the Memorial Hall for Antoine de Saint Expert because we need to catch the 3 pm bus. Time is of the essence! I think it was around 4 in the afternoon when we arrived in the Garden of Morning Calm. You see, the garden is pretty dull during the winter. 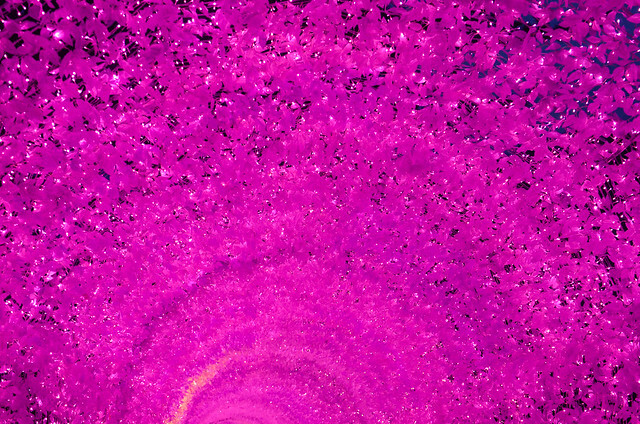 It look absolutely amazing during Spring and Autumn, at least based on the photos I've seen online. 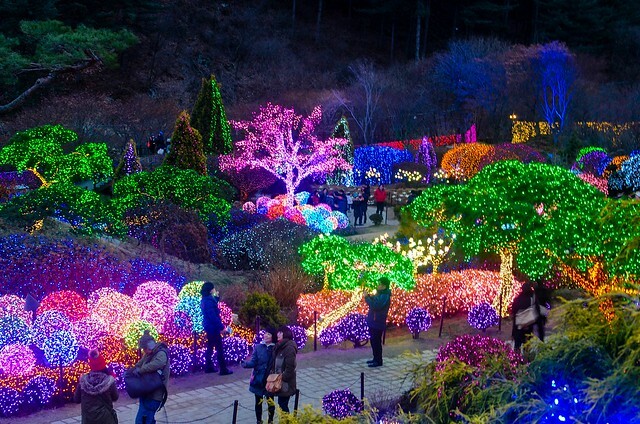 The primary reason why we were there is because we want to see this dull garden in a whole new light. 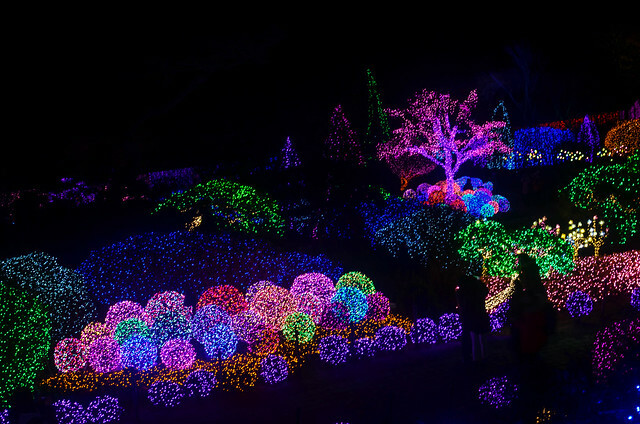 At sunset, the gardens come alive with magical Christmas and winter illuminations. 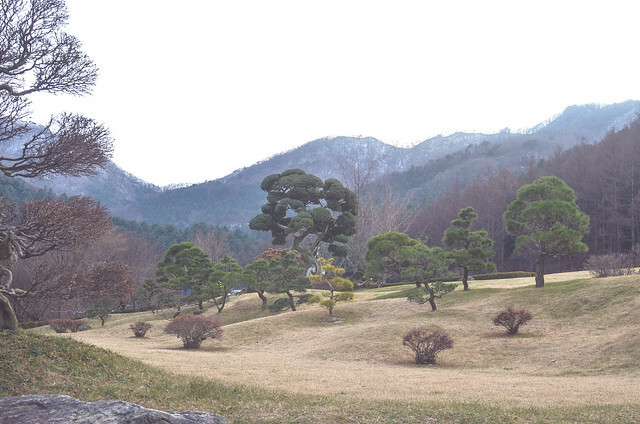 If you're planning to visit South Korea in the winter, then a trip to the Garden of Morning Calm is a fantastic addition. 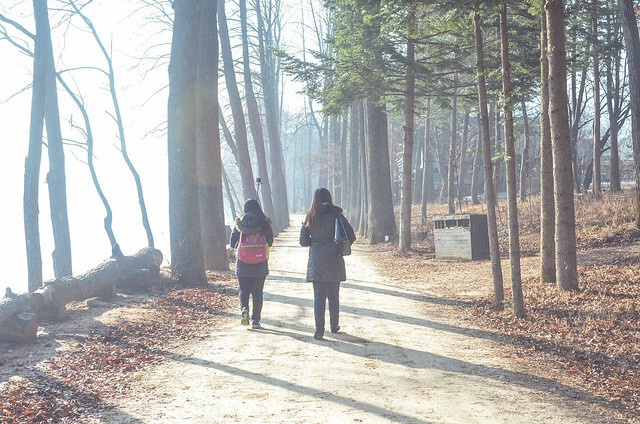 If you want a hassle-free travel to Nami Island, Petite France and Garden of Morning Calm, join a small group tour instead! Check out the tour below! 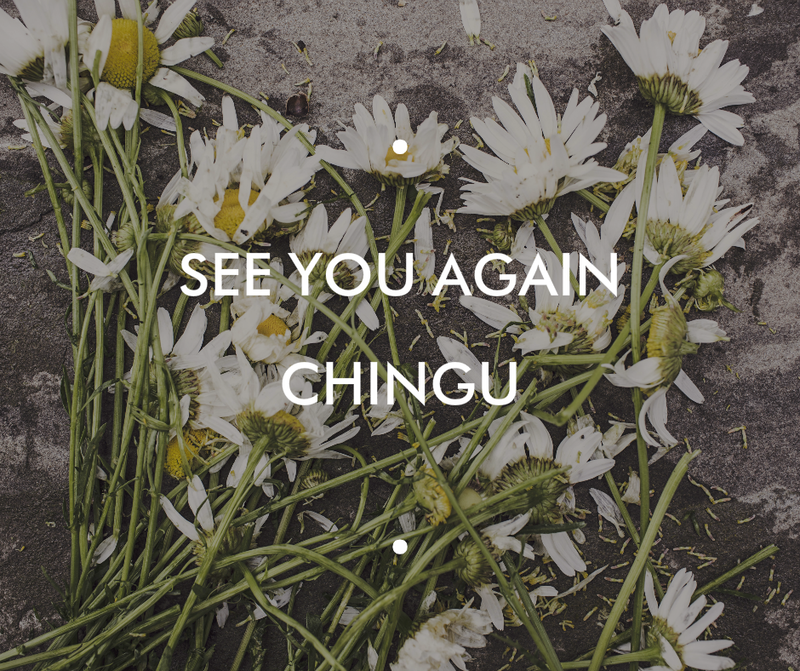 My dog Chingu passed away five days ago. He was two years old. He was smart, amazingly so, stubborn, funny, sweet, and very vocal. He was a member of the family and brought so much joy and warmth into our lives. RIP my beautiful, good boy. I'll miss you knocking on my door every morning to wake me up. I'll miss your bark when I leave and return from work. I'll miss your bite whenever you want to play with me. I’ll miss seeing you wag your tail at the sound of my voice. Sorry my dear readers if I shared something depressing at the beginning of 2016. I just want a place where I can write something about my dog. I am totally devastated and I am trying hard to cope with grief. And, I just hate the fact that our society often does not acknowledge loss of a companion animal to be a significant cause for grief.